Trekkie or Trekker? Regardless, you'll love this! In the year 2373, the U.S.S. Thunderchild NCC-63549 was a member of the fleet that fought against the Borg in the Battle of Sector 001. Now, this Akira Class starship is back and bigger than ever! This XL Edition is carefully recreated in high-quality die-cast ABS materials and measures approximately 9 inches long. It comes with a special stand so you can display it the way you want to. Inside the accompanying exclusive collector's magazine, find out about the making of Star Trek and the filming of the Thunderchild. 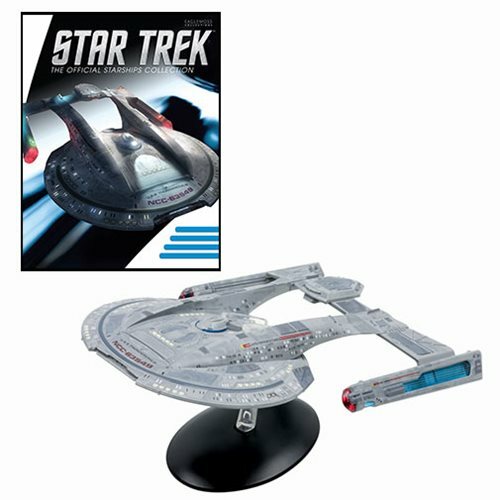 This sensational Star Trek Starships Thunderchild Akira Class XL Edition Vehicle with Collector Magazine is a fitting piece for any fan's collection.